A popular plant sold at box stores and nurseries is the Tropical Hibiscus (Hibiscus rosa- sinensis). This well-known species is hardy along the Gulf Coast, California, Florida and Hawaii but can be set outdoors for the summer in any part of the country. There are hundreds of cultivars that come in various shaped flowers as well as in almost every color and are sold as container plants in bush or topiary form. Hibiscus need, well-drained slightly acid soil, direct sun and some protection (filtered shade) when temperatures are in the 90 degrees. When you bring it out for the first time you need to acclimate it to the intense heat and sun. They also like a lot of water. Fertilize lightly and often with a diluted 10-10-10 or 20-20-20 during the active growing season. The disk like flowers will usually last a day or two and come in single five petals, crested single, double and cup saucer double. Hibiscus has active periods of bloom that are followed by a rest, indoors and out. So if your plant stopped blooming for a while, it may be just resting. In cooler climates, hibiscus can be enjoyed as a houseplants. When the night temperatures drop below 50F degrees bring your hibiscus indoors for the winter. To help endure the long season, keep it in a (65-75), bright sunny room (4-5 hrs) away from direct heat and drafts. Water less but keep the soil evenly moist and provide humidity with a humidifier or a pebble tray filled with water. Check for pests such as aphids, whitefly and spider mites and treat with insecticidal soap if infestation occurs. Another option is to let your hibiscus become dormant for the winter. Bring it indoors and stop watering until soil is dry and the leaves have fallen off. Then place it in a cool, dark room with temperatures of 40-45F. Check the soil periodically to make sure it doesn’t totally dry out. When the top 2-3 inches are dry, water just enough to moisten the soil and keep the plant from dying . In the spring, move your hibiscus outdoors when night temperatures are above 50F. With a little care you can enjoy these tropical flowers all year long. If your plant has grown leggy and out of control you can prune it 1/3-1/2 in early spring to reshape and keep it bushy. Pruning the roots in the fall also helps slow down branch growth. A common occurrence is yellowing leaves and leaf drop; which can be caused by overwatering or underwatering. How do you determine which one? Look at the root ball. Is it potbound? Meaning are the roots so tight that they are growing in a circular pattern with little soil left? Do water everyday and the plant still looks dry? If this is happening chances are you are ‘underwatering’. There is not enough soil to retain any water and nutrients. Instead of soaking in, the water and nutrients are flowing right through the drain holes leaving your plant thirsty and hungry. It’s time to repot into a larger container. The best time to repot is in the spring but if that can’t wait add more soil to your container to help with water absorption. I’m rescuing a tropical hibiscus that some neighbors planted in poor clay soil. They have moved away, but the hibiscus stayed behind. When I rescued it, it was all but dead. No leaves at all, other than the tiniest flash of a little green leaf bud on one stem. The other stem has no leaves, but I gently scraped the stem and it’s green. The roots were compacted and wound up, but they were alive. I repotted it in much better soil and I’m keeping it evenly watered in half sun/half filtered light (hot in Texas!). It’s slowly unfurling some small leaves now, so it’s trying to live and grow. Should I clip the stems above the new growth? And when should I feed? If the stems above the new growth is dead, then you can cut it otherwise leave it and see if that part of the stem will grow. If not cut it down to the new healthy growth. Since it is actively growing, I would give it a half dose of fertilizer just to boost the growth. As we are approaching winter, with cooler temps and less light, plants don’t need to be fertilized much. I live in southern Spain right on the sea front and have recently bought an outdoor Hibiscus pot plant. The blooms have been lovely up till now but yesterday we had gale force winds followed by some rain. This may be a coincidence but this morning I found all the three blooms had shrivelled up and have gone black round the edges. Can you help please? I have 3 indoor (hardy, I think?) hibiscus. 1 I got as a gift and the other 2 I bought from grocery stores. They’ve grown happily for years as indoor plants. One of them was quite sad-looking when I bought it 2 years ago, but bounced back nicely with care. All of a sudden, that one has dropped almost every one of it’s leaves. Before dropping, they got dried out looking and crinkly, sometimes with a little brown around the edges. They didn’t yellow. The plant has buds on it, but only a few leaves left. It is getting the same amount of water and fertilizer as the other 2, which are thriving with many green glossy leaves and plenty of buds. We thought maybe one of our cats may have mistaken the pot for a litter box, but there is no smell to indicate that. We are stumped as to why this plant so abruptly began to suffer! The bottom 2/3 of the stems are woody, with green tops. There are small green ‘spikes’ along the length of the stems. All of the lower leaves are gone, with only a few left at the tops of each stem. I want to move the plant to a different (sunnier, but often slightly cooler room) away from the healthy ones, but I’m afraid to stress it out further and kill it. I suspect you have a tropical hibiscus which is grown as a houseplant in cooler climates. I’m not sure why the one plant dropped all its leaves. If it wasn’t getting enough sun during the winter or was too cool, it can go dormant and drop its leaves. Best thing you can do for it is to cut the plant back by 1/3 and move it to the sunniest spot in the house. Don’t be afraid to cut it back as it will grow back fuller and bushier. When you see new growth, give it a dose of fertilizer to stimulate new growth. Once the weather warms up (night temps 50F) then move it outdoors. It should really perk up. Plum crazy hibiscus is a hardy (zone 4-10) H. moscheutos that produces large 10 inch flowers in July to September. It grows best in full sun but requires moist soil which should not be allowed to dry out. In hot weather, you may have to water it twice a day or move it to a cooler location. Deep watering is suggested. If you are keeping the soil moist, then I would suspect that the plant is not totally acclimated to where it is planted. Are you growing it in a container or in the ground? I have a hibiscus rosa-sinensis. I was living in wisconsin, My hibiscus was bloming all the time in the house & outside. Then I moved to Illinois a little over 2 years ago, it has been in the house since I moved here, and it has not bloomed since then. I read that it might be resting, but it has been too long for a rest. I transplanted it twice the last time was about a month or so ago, I used potting soil with plant food in it which lasts for six months. When I water it I just use plain without plant food in it. I don’t want to over fertilize it. The tree is very healthy it is full of green leaves. It lives by a window and gets lots of morning sun light, when the sun is shining then lots of light during the rest of the day, I don’t know else to do for it. All though I cut a couple of branches off and put it in a bottle with water and they both bloomed. So i was thinking maybe the tree itself needs to be watered more, i just don’t know. Is there someone there that can help. Sincerely Miss frustraited. The other plant was a hardy hibiscus…. However my tropical hibiscus is thriving very well it is still in the pot it was purchased in. It recently had some yellow leaves that came off but is still flowering big blooms. I brought it back inside bc we are having an unusally hot summer in upstate NY, and i am seeing lots of new growth and leaves at the base…..when and how should I replant to a bigger pot? and with what soil?….My family is shocked at how well this plant looks based on your advice…tallest stem is about 15inches. Would love to see it continue to grow!!! Tropical hibiscus will not survive the winter in Missouri. It will not tolerate freezing temperatures. Hi i just bought my hisbiscus and repotted it to a bigger pot then i noticed spidermites so i took the plant out of the pot washed the plant and leaves warm water not hot and washed the new pot again then replanted the pot and new soil to avoid contaminants, then i read where hisbiscus need a sandy soil so i took the plant out again added the sand to the soil and repotted it . Prior to repotting the plant the leaves had some yellow on it . Prior to potting it the bloom fell off is that normal ? Then another bloom fell off the next day ? The plant has a lot of flower buds on it the leaves are shiny and green plant looks perky but do the flowers fall off easily? The odd thing is the flowers were red at first the next bloom was a salmon colour ??? Hibiscus flowers will last one to two days and then they fall off. It’s normal. The color of the flower can change due to the amount of sunlight it gets. Less sunlight can make a paler color flower. A change in the soil ph can also affect the color. I live in AZ and have planted hibiscus plants in my front yard for the past 3 years. But every year, at around this time (end of June/July), the plants start to wither. I just noticed that one of my plants is showing signs of withering on one arm of the plant. In the past, this continues until the entire plant is affected. This then moves on to my other 2 plants. It’s like clockwork…happens every year, at exactly this time. I have them on a timed water drip system that operates twice daily, so I don’t believe that watering is an issue. Also, I don’t seem to see any insect infestation. Has anyone had this problem, or know what it is? My husband just tells me to plant something different, but the plants bloom so nicely all year, until this eventually happens. Any suggestions? Yep it is called hibiscus wilt disease, It is a fungus in the soil usually caused from overwatering it. Why dont you look it up. Yes, I have heard that. It’s especially effective with bougainvillea. What happens is the plant gets stressed and feels like its going to die so to preserve itself it will start to produce flowers so that it can make seeds. Don’t let it get too dry. There are other reason why a plant won’t flower. I live in central Illinois.. planted several hardy hibiscus, mulched them and put miracle grow granules around the soil. I water daily for about 20 minutes. They get full sun about 7 hrs a day. The last two days I’ve noticed droopy leaves on some but not all of the plants… any sugesstions? Is it possible that you are watering them too much? It’s better to water well less often than to water little often. Depending on temperatures, try spacing the watering to once or twice a week.You will have to water more often in hot weather. Plants need about 1″ of water per week. Since the plant has been traumatized, it would keep the plant inside until the weather really warms up. Tropical hibiscus will respond in warm weather. Keep the plant slightly moist and hold off on the fertilizer for now. Be careful not to overwater the plant as that can lead to root rot. If the soil is moist and the leaves are wilted then there may be a problem with root rot. When you bring it out for the first time you need to acclimate it to the intense heat and sun. Once new growth starts, you can feed it with a diluted (1/2 strenght) 10-10-10 or 20-20-20 fertilizer during the active growing season. Thank you so much, I did what you said and it had several small blooms after that,however its been about 3 weeks with no blooms at all, but the fertilizer burn looks like it is going away, and the plant is growing and very green, it looks like some buds may be forming, but how do I know when to change the pot? Im scared to move it since its ALIVE! Also walmart had on sale a regular hibiscus,wanted to buy it Does that have to be cared for differently? I’m not sure what a regular hibiscus is. Is it a hardy one or a tropical one? There should be a care tag on the plant. Live in Florida. Have 2 braided tropical hibiscus. Had them planted in ground for about two years, decided to transplant still outdoors about 3 month ago. All the leaves turn yellow, dried up and dropped. The yellow flower hibiscus has start it grow much leaves and to give flower. However the red flower hibiscus which was the first to show very small leaves of growth, has stay at that – very small leaves in four spots of the plant. Have cut it back some already. Has 2 big leaves hanging on as well. It’s the start of spring here. I give it much water, fertilizer, sun, shade. Is it still alive? Do you think the plant is still under stress? What can I do? Your advice is would be much appreciated. Thanks in advance! The red hibiscus is under stress and something is preventing it from growing. It could be the soil, too much water, or not enough water. Does it get full sun (6-8 hrs)? It’s hard to say but since it is not growing from the time you transplanted it, I suspect that there is something wrong with the root system(soil). I have a hibiscus plant of 5-6″ ft high.Recently I brought it indoors and pruned to half of its height.Recently I observed that i got infested with aphids and sprayed the insecticide which treats all kinds of insects includinh aphids.I see black and white spots(eggs of aphids) on every leaf.I again manually removed all those infested leaves and sprayed the plant with insecticide after around 5 days.Now my plant looks a little better than previously before treating.Will these aphids affect my plant anymore further?if so what can I do to prevent this infestation so that i can totally remove them before they hatch when temperatures warm up. Hello, I am having great success with my outdoor tropical hibiscus. My plant blooms for one day and then the flower drops to the ground. My question is do I leave the empty flower pod on the plant or do I cut it off back to the stem of the plant? The flower pod will dry up and fall off by itself. Hibiscus need full sun and warm temperatures to bloom. They are heavy feeders but sometimes too much fertilizer will keep them from blooming. In addition hibiscus like to be pot bound to bloom. It may be that the container is too big for the plant? Pruning the plant can also stimulate new growth and bloom. I bought a hibiscus three years ago and transplanted it almost right away into another pot. The first year it was full of bright vivid red large blooms. At the onset of the second summer I dug away the top layer of soil and added about three inches of potting soil to help feed it. It did very some growing but all the blooms were small, faded looking and had a short period of being open of about one day. This year I put some more effort into it. About three months ago I pulled it out of the pot, basically cut off the bottom five inches of roots & soil, added new potting soil to the bottom of the pot, again dug away the top few inches of potting soil to add new, and pruned it. Within a week it had all kinds of new growth and within three, showed signs of new buds. Well, as of now I’m still seeing explosive growth but all the blooms are having the same problem of being severely faded and about 2/3rds the normal size. I’m in the Dallas area, it’s outside and placed to get about eight hours of sun and I water thoroughly once daily, as the soil is dry after 24 hours. Any ideas? I am keeping my plant totally in indoors near a window where we can get full sunlight right from noon to evening.It is absolutely a dry place.Also i am making sure that the water drains out but i hardly see excess water draining out of the pot.Also occasionally i see some insects in my plant soil.i dont know what kind of insects are they.I also see some white flies occasionally.But i am pretty much sure that there are insects in it.2 weeks ago I dissolved some insecticide which is suitable for all kinds of flowering plants and kills almost all kinds of insects and applied on my plant soil.From then i am seeing that all leaves are dropping down.My plant is almost empty now.even i though i see buds coming out,they are unable to bloom completely.Please advise what can be done to save my plant. Indoor light is not good enough for a hibiscus. It is a tropical plant and needs humidity and sun to grow and bloom well. It sounds like it has a root problem. If the soil is wet and the plant is wilted, then it may be root rot. On the other hand, is it getting enough water? If the plant has been in a container for a year or more, it may need to be transplanted into fresh soil. Unless the insecticide is labeled for hibiscus use, it can have an adverse affect on your plant. Thanks for your advise.I will move to a sunny outdoor area for atleast 3-4 hours per day.But wht i have observed is even though i water my plant thouroughly the soil gets hard and dried up very easily(usually in less than 1 day).So I will check keeping it outdoors and watering it thouroughly.My plant is just 3 months old since i have transplanted into a new pot.initially it had a transplant shock and later it recovered and used to bloom every other day.Now since 3 weeks it started shedding out all leaves and even buds are not able to stand on the plant.they are dropping down even when i touch them.please let me know if can use any fertlizer at this stage or i need to replace the soil. I have used the potting soil mix available in stores like lowe’s ,or home depot. Also please advise what fertilizer I can use beacuse recently i fed my plant with 20-20-20 fertilizer(only very little).Are insects like white flies responsible for leaves shedding and turning yellow for hibiscus? Yes, insects can also cause yellow leaf drop. I am badly in need of an advice from you beacuse my hibiscus plant is now shedding all leaves and it is almost looking empty without any leaves.Most of the leaves are turning yellow and dropping down.But i see flowers blooming everyother day.But they are not looking so healthy.Some of the flowers are hardly able to open up.I am watering the plant only when i see the soil as dry to touch(probably one in 2 days and sometime alterante days).I am unable to understnad whether i am ‘overwatering’ or ‘underwatering’ the plant.Please advise what can be done to save my plant as soon as possible. What kind of weather/temperatures is your plant in? When you water – do you soak the plant so that they water drains from the bottom? I have one of these that I bought last summer. It bloomed all through the summer with these gorgeous red flowers. I took it indoors in October (I live in Pittsburgh). It did great through the winter – healthy leaves and even occasional blooms every now and then. So, a few weeks ago I took it outdoors again. And while it looks very healthy, there have been NO blooms since then. In fact, no blooms for probably about 3-4 months now. So – will it bloom again ever?! Anything I can do to encourage the process?? Has it put on new growth? If its in the same soil from last year, then it is lacking nutrients which need to be replenished. Hibiscus are heavy feeders. You should fertilize lightly and often during the growing season using a diluted 20-20-20(1/2 dose) or 10-10-10 formula. Follow label directions. You can also add timed release pellets into the soil. Hi there! I recieved a braided hibiscus tree as a gift from my beloved who thought I would adore it (and I do, it’s lovely), but I have very bad luck with plants. I am afraid of killing it, I have attempted to grow many different types of plants, indoor and outdoor, sprout and tree, flower and vegetable, all to no avail. Since this was a gift, I want to make sure I can take the absolute best care possible and I want it to be a happy little tree! I love plants, but no matter what I do they always keel over and die. Do you have simple advice for someone who is not plant savvy to keep this plant alive and healthy? I have a nice sunny spot I think would be perfect in my yard, full sun most of the day and not too hot with good drainage. Thanks very much for any tips you send my way, I appreciate it! The location sounds good. Hibiscus likes full sun, slightly well drained acid soil. Water regularly, almost everyday when the weather is hot (90â€²s), make sure the water drains out from the botton. Fertilize lightly and often during the growing season using a diluted 20-20-20 or 10-10-10 formula. (eg: instead of 2 tsps of fertilizer use one tsp). You can also add timed release pellets into the soil. Hibiscus flowers last only a day. But once the plant starts blooming you will enjoy new ones everyday. Be aware that your braided hibiscus is a tropical plant, hardy in zone 10-12; so if you live in a cooler climate. it will have to be brought indoors for the winter. For more info, read the above article regarding hibiscus care. I bought a small hibiscus tree, and I planted it outside where it gets around 8 hours or more of sun. The temperatures here in Texas are about 80 degrees right now but for the months of July and August it can get to 108 degrees. I’m a little worried since it gets full sun that it may get too dry and die. I don’t want to move it to a different spot. Will it be safe or should I move it? Hibiscus are tropical plants and will tolerate hot weather provided it get plenty of moisture. So you have to decide if you want to spend lots of time watering your hibiscus in hot weather or move it to a slightly shaded area. The first year after planting is critical for the plants survival and much care should be taken to keep it stress tree. Thank you sooo much for your advice.I moved my plant to a shady dry area and i really see the difference.Leaves are slowly raising up but still a little weak .I also see that my plant is shedding many leaves turning them yellow on the bottom side of my plant.Upper section of leaves are doing pretty good.I am watering it only by checking if the soil is dry to touch.Please suggest me if there is anything else i can take care of.And also the leaves are not looking shiny even though they are green. I feel that my plant needs still more time to recover.PLease let me know if there is anything else i can infer from these symptoms. As the plant get healthier, the leaves will shine. Once the leaves perk up gradually start exposing the plant to more sunlight and when the plant starts to put on new growth feed it with a 1/2 dose of fertilizer to stimulate more growth and bloom. You should see some new growth by now. It sounds as if it didn’t survive the winter. Before you give up, give a little more time. Maybe it’s waiting for warmer temperatures? Keep the soil moist not wet. Perhaps it is just slow to grow. Okay, thanks – still no growth and I’m just keeping it around until I see something. Hi I just got a hibiscus plant from the store and it is around 3ft tall.I then decided to pot it into a large pot and got some potting mix soil and put it into a large pot.Right from that day,The leaves started going lean and drooped downeven thogh i am watering it everyday.then as per my friend’s suggestion i stopped watering it for 2 days since I thought i was over watering it.Because of that my plant went more weak.I am unable to understand the problem.It has enouigh sunlight everyday…i put it indoors just near my window where we get sunlight atleast for 6-7 hrs a day.Also some leaves are shedding down after turning yellow.Can somebody please let me know how can i get my plant back to healthy state…I am very much worried about it as i loved it so much when i bought it. First- move the plant to a shaded area so that it can recover from being repotted. You disturbed/damaged the roots when transplanting and the hibiscus needs some time to recover. The roots are not able to keep up with the leaves and that’s why they are wilted. Overwatering will not help the plant. Let the plant dry out and water when the top 2 inches of soil are dry. When you water make sure that any excess water drains from the bottom. Once the plant perks up, gradually move it to more sunlight and eventually to your 6-7 hrs sun location. Good luck and enjoy. Fertilizer is shown in percentage of the total. So a 10-10-10 contains 10% Nitrogen, 10% phosporous and 10% Potassium and the rest is 70% of inert material. It should always total to 100%. A formula of 20-20-20 is twice as strong. When fertilizing read the label recommendations as to how much and how often. Your plant may still be recovering from the pruning and transplanting. Hibiscus has active periods of bloom that are followed by a rest, indoors and out. So if your plant stopped blooming for a while, it may be just resting. Hibiscus need full sun and warm temperatures to bloom. You don’t mention any fertilizer. They need regular feedings to bloom. Fertilize lightly and often during the beginning and middle of the growing season. Use a balanced 20-20-20 with micronutirents included. Follow label for dosage. are dead flowers from tropical hibiscus poisonous to dogs???? Please advise. No, in fact the flowers are edible. Hi i have problems with my hibiscus:( it looks like there are this white tiny eggs all over stem. Its still blooming but its loosing leaves. Any idea what it is??? and what can i do? I have about 20 tropical hibiscus that need attention badly. The are dropping the buds, have gnarly leaves and several insects. They are tall, about 7 or 8 feet and very full. I have sprayed several times with a couple of different insecticides (neem and triazacide). Should I thin them out? I have only pruned the top 1/3 of the plant. If I thin them out a little, will that help? I am in Florida so I am not worried about freezing or frost damage. It is going to take a long time to prune them all. I am thinking that if they weren’t so full the insecticide may work better…? Pruning should help. It will give the insect less plant material to feed on. Do it soon so that the new growth can harden off before cold temperatures (35-40F) arrive which could easily damage new growth. After you prune your hibiscus back, treat it for whatever insect problem you have. It is better to know what insect you are trying to control/elliminate so that you can use a treatment that will be effective. Here’s some info on hibiscus insects. I have a orange braided hibiscus and it had aphids and spider mites but i used the dish soap solution twice a week and all the bugs are gone now but the leaves still keep turning yellow with black spots and they all keep falling off, its only about 2 feet tall but it almost has no leaves and it doesn’t bloom anymore, what do i do? or what am i doing wrong? I would suggest that you let the hibiscus go dormant. Place it in a cool room with at least 3-4 hrs of sunlight and kept slightly moist to keep it from drying out. This is the minimum requirement just to keep it alive. Another way is to let the plant go dormant by allowing the pot to dry out and leaves to fall. Keep the plant in a cool 40 degrees and dry. Water just enough to keep the stems from shriveling. Prune it back in the spring and start watering. I have three 10 yr old hibiscus plants in our backyard in Colorado. They are now 20 ft tall and the branches are starting to droop. I want to confirm that I can cut it back in half to 10 ft in early spring. Rule of thumb is to cut back by 1/3. Make sure you cut above a node and leave 2-3 nodes of last season’s growth on the branch for new growth to emerge . I grew my first hibiscus from a four inch plant (in the gound) and it will be blooming soon. Where do I cut the dead blooms off after the blooms die? Congrats on your success! The flower will dry up and can be pulled off or cut off just below the base of the flower. Yes, the plant can get pot bound and it may need to be repotted or top dressed. It most likely needs more nutrients from the soil. Pruning is good for the plant and would not affect bloom. In fact, it can stimulate more bloom. Just one week ago I purchased a small tropical hibiscus with a braided trunk and it seems to be in serious trouble already. I repotted it in a slightly larger container with the same fresh Miracle Gro “moisture control” potting soil I used for my other potted plants. About 3 days after repotting, it started getting very droopy. Thinking I was overwatering it by watering it every day, I started watering it every other day. Since then, the leaves have continued to droop and most have actually started drying out and falling off. The soil is not dry to the touch, however. As far as coloring goes, most of the remaining leaves are completely green though some have slight yellowing. The weather here in Minnesota has been pretty temperate (Highs around 80 and lows between 50-60). Is my poor plant just stressed from the replanting, am I watering it wrong, or is this something more serious like wilt disease? It was beautiful and flowering just a week ago! It sounds like you are overwatering the hibiscus. If the soil is moist and the plant is wilted then it is having root issues caused by too much water. The plant is stressed from repotting and too much water. With moisture control soil, it is difficult to gauge how often to water because the soil stays wet longer. You should lean toward watering less. Let the top inch of soil dry before watering again. It may also be wilting from too much light exposure. Move the plant to a shady spot until it recovers. How can I tell if my hibiscus plants are dead? We had snow this year in Houston and im not sure if theyre dead or not. I presuming that you are referring to Tropical hibiscus- if not let me know. To see if your plant survived scratch the surface of a stem and see if there is any green. If the stem is dried and brown under the â€œskinâ€ then its dead. Wait a few more weeks for the weather to warm up before you do anything, as the roots may still be alive and may send out new growth at the soil level. If you had some winter damage, wait and see if there is new growth emerging anywhere on the plant and then prune the dead stems up to the new growth. We live in San Diego and have a Hibiscus outdoors all year long. We have had it for 13 years. Last year the leaves fell off and now the leaves that grow back are very small. They Hibiscus still blooms, but it looks bad with such tiny leaves. We water and fertilize it the same as always. Could it have a disease? I have a hardy “Big red hibiscus” that i bought from a plant catalog and received in September. i live in an apartment in Massachusetts with hopes of moving soon, so i kept the plant inside. the plant started off doing great and growing new leaves. its now December and it looks to be going downhill. the plant is about 4 or 5 inches tall. there were 3 leaves at the top, one turned yellow and fell off while the other 2 dried up and are still on there. also the top inch and a half of the stem turned brown and looks like a dead stick. the next inch down is sort of whitish green. the bottom couple inches look healthy and green with new leaves buds starting to grow, other than them there are no leaves on the plant. i wasnt sure if its dying or dying back for the winter. is this normal or is there something i can do to help it? at the same time i also received a hardy white hibiscus and that one is doing great, but im trying not to compare them because they are different types. i have the plant near a window so it gets the sun when it comes out, and the temp is usually around 70-75. i water it when it looks dry on top of the soil. the air might be a little dry, could that have anything to do with it? thank you so much in advance. The low light indoor conditions cause tropical hibiscus to drop their leaves and go dormant. Since it has dropped all its leaves, keep the plant in a cool 40 degrees and dry. Water just enough to keep the soil slightly moist and the stems from shriveling. In the spring, place it in a warm sunny window and start watering. If you don’t want to store it dormant, place it in the sunniest window and water moderately(much less than you would in the summer). Growth will be sparse and spindly. Your hibiscus is in its “dormant stage”, so the best thing you can do is provide it high light and water occasionally keeping it on the drier side. It will grow very little indoors and may or may not put out a few flowers. In early spring cut back the stems by 1/3 to shape the plant and repot in fresh soil. You can also trim the roots. Once you see new growth, fertilize and when the weather permits bring it outside into shade until it is acclimated to higher light exposure. I bet you bought a tropical hibiscus. When you planted it in the ground you put it into transplant shock-thus the wilting drooping leaves. Too much sun and not enough roots to support the foliage. Cutting it back may help, but hopefully, you didn’t cut it back too much. It sounds like it has some new growth coming back. Fertilize it with dose 10-10-10 to stimulate new growth. Because of the root damage, there is nothing you can do until the roots begin to recover. It may be that they will not especially since they had a fungal rot before you transplanted them. The yellow leaf drop can be a normal response because the roots cannot support the leaves. When/if you see new growth sprouting, then you can move your plant out to the sun. it has a good drainage but now the plant looks very droopy it is almost dead when i plucked a leaf it was almost dead so what should i do please help as soon as possible i will cut the plant to its 1/3 after your next message and also please message that how much should i water the plant it is a hot day with cold nights here in india. and there is a foul smell coming from the roots when i moved the soil and saw the soil attached th the soil had become black and a foul smell was coming from it.so what should i do……..reply soon my plants life is in your hands…..
You just mentioned the most critical problem – a foul smell from the roots means that they have root rot caused by a fungus. This is usually caused by overwatering (keeping the plant to wet too long). This problem can also occur with poor soil that doesn’t drain well. Hopefully, when you replanted you used fresh well-drained soil. At this point make sure the plant dries out between watering and keep the plant in the cool shade until it recovers. If it recovers. i have a red hibiscus i repoted it in a bigger pot and now the leaves look droopy and the plant looks that it is about to die and it hadn’t flowered for a long time so please help me soon i am waiting for your reply. send it to riddle_man@rediffmail.com thank u very much. it will be kind of u if u reply soon.. It sounds as if your hibiscus is in transplant shock. The roots have been disturbed and damaged and they are struggling to send moisture to the leaves that is why they are wilting. If you cut back the plant by 1/3, it will help the plant recover faster. Keep your hibiscus in a shaded area until it recovers from transplanting (about 1 wk) and then slowly move it to more sun. Make sure when you water that it drains from the bottom of the container so the roots are not sitting in water. A root stimulant will also help new root growth. I just repotted my hibiscus the potting soil I used had fertilizer in it. How long should I wait to fertilize with 10-10-10. Also the fertilizer I have is granules how much would I use of it to fertilize? Thanks! You can fertilize your hibiscus when you see new growth. Follow the direction on the fertilizer label for how much to use. You’re better off using less fertilizer more often than too much at one time. The leaves on my hibiscus have all yellowed and/or fallen off yet the plant continues to produce flowers. What could be causing this? Some yellow leaf drop is ok. The hibiscus may just be “shedding” some of its old leaves. Yellow leaves can indicate that the plant is under stress of some kind. I would first check for insects. I have two very old hibiscus in a part shaded spot on the east of my house. I live in Houston and they happily stay outside all year. They don’t flower very much in their current location but they get VERY tall- atleast 6 feet. I’m thinking of transplanting them to the backyard for more sun in hopes of getting more blossoms. Any advice for transplanting old hibiscus bushes? More sun should help with more blossoms. Transplant your hibiscus before it starts sending out new growth. In your case late winter/early spring would be best but you can do it now. Pre dig your hole before transplanting. Get as much of the roots system as possible and transplant immediately. Do this on a cloudy, overcast day. Water the tree and add a root stimulator to help start new root growth. Make sure it stays moist, not wet. Add some mulch(2-3 inches) around the tree to maintain moisture during the hot summer months. To ease transplant shock (wilting leaves), trim the tree by 1/3-1/2. I have a 2 year old hibiscus plant that just overwintered. I am concerned because the hibiscus has 3 large branches at the base, that then branch out repeatedly, but all of the leaves on two of the branched segments dropped off months ago, and there is no growth on any of them. The remaining branches connected to the third main branch still have leaves and recently bloomed a bunch, but there is still no growth on the other branched segments. Is it possible that 2/3rds of the plant has simply died, and yet the last 1/3rd still soldiers on? Can I fix this problem? Yes, its possible that 2/3 of the tree died from dieback disease caused by a fungus (I’m not making that up). Wait an see if the branches are really dead. Do the scratch test to see if there is any green on the stems. The only cure for dieback is pruning away the dead branches. I have a Hibiscus bush and recently brought it inside due to the cold weather in N.J. First, I wanted to ask if there is anything I can do for my plant in the house that will help it to grow, flower, and stay beautiful. My house is pretty hot in the winter approx. 75 to 80 degrees at times. Right now the plant seems to be flowering beautifully about 9 flowers at a time. Only issue with the flowers is that they do not seem to be that beautiful bright red they once were when living outside. Now they are a light red almost pink color. Secondly, I wanted to ask if I can dry out the flowers to make tea. If so, how would I proceed in doing so? I have searched for some direction on this but really no good results! Can you please lead me in the right direction? Are these flowers edible and can they be used in any other recipes that you know of? The flowers will become lighter due to less light exposure. 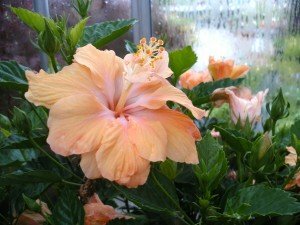 Your hibiscus will need some additional humidity during the winter to do well, otherwise it will drop its leaves. I have about 30 tropical Hibiscus in plant and tree form. I have had great success with them for several years. They are over-wintered and flower well in my greenhouse. They are brought out onto my patio with optimal conditions. Every year (from May on), they bloom all summer profusely. This year, with the same regimen, I have no flowers this far into the season! The plants, especially the trees, have grown huge/wide with abundant beautiful leaves, but NO flowers. I had been using 20-20-20 Miracle-Gro, but swithched to the Bloom-Booster in late June..no difference. Looking at the branch ends, I see many tiny falling buds, some yellow, some brown, while some branch ends have nothing but leaves. I had a problem with rose midge this year in the garden. Now, I’m thinking this may have moved up to the Hibiscus (10’above). Should I spray Insectidicial soap? The nights are about 65-70 lately. Thank you! Flower buds are the first to tell you that the plant is under some kind of stress which can be too much or too little water or excess fertilizer and insects such as thrips. In addition hibiscus have a tendency to drop buds when the weather gets too hot. There’s nothing you can do right now. Keep the plant in a protected, shaded area. You don’t need to water every day, let the soil dry out between waterings(top 1 inch). Hopefully, it will recover. I have 2 hibiscus bushes that I got this spring that are outside in large pots. They were doing wonderfully and blooming every day. I believe they are in their “rest” period because the blooms have slowed down. But my question is that one of the bushes all of a sudden became very limp and the leaves and buds are hanging. We had some heavy rains and I noticed some water pooling the the pot. Could this be the reason and if so what should I do? You plant is showing symptoms of hibiscus wilt disease, which is caused by too much water. The leaves darken (don’t turn yellow) and wilt and then die. Drain out as much water as you can and in a heavy rain move it to a sheltered area away from excess water. One remedy is to do a soil drench. Take 1 pt. of bleach to 2 qts of water and pour into the soil-this should kill the fungus that is causing the problem. Good luck. Hopefully, it will recover. I’ve been (trying) to acclimate my hibiscus to the outside this past week. I had it outside for about 6 hours today – temps were in the mid-60s, not much wind. It’ll be dropping into the upper 30s/low 40s so I brought it back inside. Yesterday all the leaves were strong and a healthy shade of green. When I brought it in tonight, most of the leaves have faded and are limp and very weak looking. Did I stress it too much today? Is there anything I can do to bring it back to life? Hibiscus need to acclimate slowly, especially if they were indoors all this time. Too much sun too fast will cause the leaves to fade . It should perk up. Take it out to AM sun only for a few hours at a time for a week and then shade for the rest of the day provided the weather is warm enough. I’m afraid fertilizer won’t help in this case. Fertilizer only works when then plant is healthy and actively growing. The reason it is dropping leaves and dying is that it is “dying” to go outdoors. This is a tropical plant that thrives in full sun,warm temperatures and humidity, you are providing it with filtered light which is not enough. Unless you change the environment it will continue to sulk and decline. A note for people with dogs and Hibiscus. My golden retriever LOVES the flowers..and in searching the internet, Hibiscus is on a few “safe for dogs” lists but is on more “toxic to dogs ” list. The day before yesterday he ate a lot of flowers. They made him very lethargic, his gums were very pale, he had no energy and acted very odd in general. His blood pressure was very low! He had finally eaten enough of those darn pink blossoms to make him quite sick. So we had to cut the tree down today. Just for information for all that have dogs and Hibiscus trees! I have over-wintered my tropical hibiscus very successfully until now. It is blooming again, but at the same time one or more branches starts wilting. What is happening? HELP! I have pruned those that wilted so far, but seems to be getting worse. It’s still too cold to move outdoors. Wait till night temperatures are around 55F to leave them outside. I am presuming that you are watering it but be careful not to over water. If the soil is wet and the plant is wilting that means there is a root problem. In that case let it dry out and water less to allow the plant to recover. Outdoor environment will help a lot but remember that when you place it outdoors put it in a shaded area for the first 2 weeks so the plant can reacclimate to the bright light outdoors. I was just going to cut back my Hibsicus for the spring, and now notice a few flowers and buds growing. I should have cut them back earlier. Is it too late to trim them way back for the summer months, or should I wait until the buds are finished flowering? It is better if you cut it before new growth starts.If your’e going to cut it back ,then do so now. Later will be much harder as you will have more new growth. Bite the bullet and do it. You’ll be happy when it comes back bushier and produces more flowers. I live in Baton Rouge, LA and I have a few hibiscus plants. I know that you can take cuttings and root them, but my question is, when would be a good time to do this and how much should I cut? To propagate tropical hibiscus, the easiest way is to take 5-8″ cuttings of new growth in March or April. Cut just under a leaf node and remove lower leaves. Dip cut end in rooting hormone and stick in a small pot filled with a well-drained soil such as sand & peat moss. Keep it slightly moist(not too wet) out of direct sunlight in temperatures ranging from 70-80 degrees. Should root in 4-6 wks. Once cuttings have rooted plant in a 3″pot and when cutting is 6″ long cut the main stem to promote side branching. Take a few cuttings in case some don’t take. I was in Wash. DC recently and saw a rather large tropical hibiscus (4″ trunk) about 5-6′ tall. I wouldn’t think that a plant this large would be moved indoors for the winter and then replanted in the spring. I live in Georgia and have three beautiful Yellow hibiscus planted outside and would like to leave them out for the winter. Winters here are about 25-45F. Would this be possible if the plants are mulched around heavily? It would be a gamble. Tropical hibiscus tolerate freezing temperatures only for a brief time. If you mulch heavily around the plant you may be able to protect the roots from freezing but the top of the plant will most likely die. In the event of a freeze wrap the stems (if you can) for protection. With global warming – who knows what kind of winter you’ll have. I have a few Tropical hibiscus plants (30) and a few of them are looking rather weird. This is affecting the Rum Runner Hybrids mostly, When I first bought them the leaves were nice and full, now they are smaller and cup upwards. This change began to take place only a few weeks after I put them in the ground, They receive full sunlight and are watered sufficiently. I started fertilizing about a month ago and still no change, other than big HUGE Blooms. I thought I had read someplace it was some sort of deficiency but I cannot remember of what… ANy thoughts? Hibiscus. what can you do to make humidity for the plant when it is brought indoors for the winter month. I know it likes 3-4 hrs sun. but I put my plant in a spare bedroom.. can you help me out ??? You can increase the humidity by placing the plant on a shallow tray filled with pebbles. Pour water into the tray but don’t let the water level rise above the pebbles. The rising vapor will increase moisture in the air. Grouping plants together, and spraying a fine mist every morning will also increase humidity. A humidfier in the room will work best. The high heat can slow down blooming. Have you been fertilizing your hibiscus? They are heavy feeders and may need nutrients to bloom. Try a diluted (1/2 dose)of 20-20-20 or bloom boost fertilizer every two weeks. Remember to water the plant first before fertilizing or you can burn the roots. I live in Illinois and I just bought a Hibiscus tree about a month ago. Over the last week, a lot of the leaves are turning yellow. Everytime I go outside to water it, it looks like it is really dry so I’ve been watering it everyday. I thought it might help if I put mulch on the top of the soil to keep it from drying out so quickly. Is that a bad idea? From the other postings on here, it sounds like I might need to re-pot it. Any suggestions? I have 2 of the Hibiscus plants. The first is the Hibiscus bush (plant) and it is inside all year long. It is going crazy but no flowers lately. We are into fall here and even though my plants are indoor plants, will they stop flowering? It is really leggy!! All over the place and I am pruning as we speak. Hopefully that was ok. I was checking to make sure I was doing this right. The other plant is the braided tree and it happens to have 2 different colored flowers. They appear to be double flowers also. Any tips for that plant? It was a fall special and it will be an indoor plant but the cold season is approaching. Less sunlight and cooler temps will seep through the windows. Dryer in the house. What should I do to help them out?? Thanks so much!! At this time of year, your hibiscus can stop flowering for 2 reasons 1. It may go dormant for a time and then resume flowering. 2. Not enough sunlight. The hostile indoor winter conditions are basically just for survival of a tropical plant. During the winter give it as much sun as possible at least 3-4 hrs of direct sun, add humidity by using a water pebble tray or humidifier and keep it slightly cooler and dryer. It’s ok if you pruned it now but keep in mind that you can cut it back in early spring by 1/3 – 1/2 to get a fuller, bushier plant. With a little love and care your plants may still bloom indoors in the winter. have a hibiscus that i keep on my belcony in a pot i have brought it in for the winter as it gets VERY cold and it would freeze, do i cut it back? it is only 2ft high, i love it and want to keep it for next summer. You don’t need to cut it back. Pruning is done to shape the plant, get rid of diseased/dead parts and make it managable size. It also is used to stimulate the plant for new new growth and flowers (which would work in the spring). If you have an awkard looking leggy plant then you might want to prune it in early spring to reshape the plant, otherwise leave it alone. According to the National Aminal Poison Control Center Hibiscus sp. is listed as a non-toxic plant. what month should hibiscus seeds be planted. early spring, late spring.early summer, late summer, or should you pot them first and then transplant. I havent been able to find out any info. No specific month is necessary, especially if you have a greenhouse. You can plant the seeds immediately after harvesting or store them dry in a envelope@ room temps . I would plant in late winter to get the seeds growing and then the seedlings will be ready for the warm weather outdoors. Plant seed 1/4-1/2″ deep in a seed starting medium @ temperatures of 75-80 degrees. Keep the medium moist, not wet. Seeds should germinate in 1 week -to one month. Once the seedlings have several sets of their true leaves and the stems become woody 3-4″ plants, transplant into individual pots. I am new at Gardening can you tell me how to get seeds from the Hibiscus plant so i can replant more..
Fertilized Hibiscus produce pods that take a few months to ripen and expose the seeds. To get a pod you need 60-80F, high humidity and of course two flowers in bloom. The new seedling may vary according to the genetic makeup of the plant. Hi, I live in Scottsdale AZ and we planted 3 Lipstick Hibiscus last year in full sun. There were a couple of nights last winter when we had frost and I forgot to cover them. They looked terrible but recovered and grew all new leaves. This summer, 2 are gorgeous and one is not. The sick one wilted and died on just half of the plant a month ago. Now the good side is wilted, too. What could be happening? Thank you. Wilting can indicate some kind of root problem. Lipstick hibiscus is sensitive to root rot if the ground stays wet. It needs frequent deep watering but also needs good drainage. I live in Phoenix and just planted 3 hibiscus plants. The smallest one seems to be doing well, the 2 larger ones seemed to start wilting and dying before I could even get them in the ground. They both have lots of leaves turning yeloow and the other leaves have started to kind of dry up. They seem to perk up in the eveining and early morning, then by midafternoon they are very droopy. Is this transplant shock? How often do I need to water them in 105 degree weather? I appreciate your help!! It may be a combination of transplant shock and too much heat. Your plants need to get acclimated to the new environment, the middle of a hot summer is a tuff time to do this. The roots are not developed enough to send water up to the leaves, that’s why they are wilting. Make sure your soil doesn’t dry out but don’t overwater. You may have to twice a day if the weather is 105 degrees. Hope for some cooler, shady days. Yellow leaves on a hibiscus can indicate several things. Plant stress-either too much fertilizer, too dry, too wet or a change in light exposure(new location,less sun)or the leaves are just old and the plant is getting rid of them. All those factors can make a Hibiscus shed its leaves .. At any rate it is a reaction to some discomfort the plant is experiencing. It could be that the rainy season has less sunny days and the plant is adjusting to the change. Watch the formula on the fertilizer(10-10-10), it should also include minor elements .If you suspect the fertilizer-hold off on it for a few weeks to flush it out of the soil. It may not be a fertilized seed pod. Tropical Hibiscus I live in the Chicago area. I bought three hibiscus rosa-sinensis last summer and placed them on my patio. They bloomed and looked great. When autumn came, I move them to my heated garbage that had a large window. At the coldest, the garbage dropped to 45 degrees and got up to the high 50s. 2 of the 3 plants lost all their leaves. In February, I moved all three into the house near a window. 1 plant has grown back its leaves and is blooming. The other two have no leaves but when I scratch their banches, it is still green. From February to May, these two plants have had no leaves, but when scratched I see green. Will these two plants come back yet? Continue to water your hibiscus and hopefully with warm temperatures it will wake up and start to grow again. Once you see a sign of growth jump start it with some diluted fertilizer. This is also a good time to prune your plant if you need to shape it. Pruning can also stimulate new growth. Hello! I have a hibiscus that is 6 years old. It is an indoor plant. When I first bought the plant I had several flowers. In the last two years I have not had one flower. What can I do to get this plant to flower again? Hibiscus like a lot of sun and warm temperatures to bloom. Not knowing what care it had, I would suggest that you prune back any leggy branches this spring and when new growth begins fertilize it with a balanced fertilizer(10-10-10) or used a timed release fertilizer. Hibiscus are heavy feeders so you should fertilize lightly and often(one a month)during the growing season. Ease your plant slowly to the outdoors by exposing it to several hours of dappled or shaded light to acclimate it to the light conditions or you may burn(scald) the leaves. Note that the newer hybrids can have a lifespan of 5-10 years. I have a tropical hibiscus tree and I brought it in for the winter and put it in a dark room and stopped watering it for the winter. Since the warmer weather has finally arrived, I put it out on my patio. Currently, it looks dead as a door nail. Did I kill this by ignoring it for the winter or will it come back? I have a Hibiscus plant that I have grown from a 3″ plant and is now about 3′ tall. The plant needs to be cut back but I am afraid to cut it and the plant has not bloomed. I always keep the plant indoors and the plant is very healthy. Any advise on making the plant bloom and how far should I cut the plant without sending it into shock? You can safely prune it 1/3 to 1/2 to shape the plant and when it starts to grow fertilize is with fish emulsion or a balanced fertilizer 10-10-10 to get it growing and blooming. i have a question about my indoor hibiscus, purchased last summer. it has grown about a foot in that time (now about 5 1/2 ‘ tall( and hasn’t stopped flowering since i got it – currently 6 blooms and about 25 buds. i can’t spot any aphids on it, but i get some dark, small spots on the backs of some leaves that appear sticky and a gel-like sticky substance at the base of some of the leaves. the spotted ones eventually turn yellow and drop ( or i remove) and it seems to be worse during a heavy bloom. it’s been a great plant and a delight…i need to know how to keep it happy. thank you for any advice you can give. The oval, bumpy, spots are scale and the sticky stuff is their excrement. If you have scale try some horticultural oil on a Q-tip and dab on individual adult scale. The oil will kill them by suffocation. Some claim neem oil gets good results. You can also try scraping them off with your fingernail. This can become very tedious, repeated baths in insecticidal soap once a week can help control the problem. One treatment is not effective as you may kill the adult but not the next generation. Check your plant often for insects so that you can control any infestation before it gets out of control. I have a 1 year old hibiscus plant (put in its outdoor spot January last year when the climate was similar to now) that has suddenly turned quite yellow and the rest looks to be dying. I have reduced it’s watering, but only by 1 minute daily (from 1 min. twice…to 1 minute once). Temperatures have been sub 40F at night. Is it less water…or the cold? Sounds more like the cold weather. Cold weather will slow down the growth rate therefore it will not need as much water. Yellowing leaves indicate some stress factor (change in temperature, less light)after all it is a tropical plant. Your hibiscus may be going to a dormant period. Allow it to drop its leaves and reduce the watering until the spring or bring it indoors for the winter..
For a tropical hibiscus, the easiest way is to propagate is to take 5-8″ cuttings of new growth in March or April. Cut just under a leaf node and remove lower leaves. Dip the cut end into rooting hormone and stick in a small pot filled with a well-drained soil such as sand & peat moss. Keep it slightly moist(not too wet) out of direct sunlight in temperatures ranging from 70-80 degrees. It should root in 4-6 wks. Once cuttings have rooted plant in a 3″ pot and when cutting is 6″ long cut the main stem to promote side branching. Take a few cuttings in case some don’t take. I have two tropical hibiscus planted outside. I have tryed bringing them in for the winter, but they always die. Is there any way I can leave them outside and cover them good? We are also having problems with bud drop along the east-central coast of Florida. Can you identify possible reasons? Too much rain and high temps? We have quite a few (all outdoor) hibiscus. Bud drop can be caused if the soil get too dry, too wet, not enough fertilizer. It is an indicator that there is some stress going on. I didn’t leave the comment, but I too have these little bugs and yes, they are as you describe. The plant doesn’t seem too terribly bothered by them, however, I have noticed some dark blotches on some of the lower leaves. They are about to bloom again, so I’d like to take some of the stress off of them if possible. If you have aphids soft-bodied, oval shaped insect-a strong spray of water will knock them off or insecticidal soap(more effective). Use it several times as you need to eradicate the insect at all stages of development. Otherwise, they’ll be back. If you have white fly- that may require a stronger chemical. Leaf drop, a sign of stress can indicate several problems either dry soil, wet soil, too much shade or insects. I would try giving it a light balanced fertilizer(10-10-10) and water regularily letting the soil dry slightly before watering again. Be sure it gets enough sunshine. I have a hibiscus, bought in Hawaii, that is just a stick with what appears to be roots. How do I plant it? Plant the hibiscus cutting in well-drained potting mix. Place the roots in a pot- cover with at least one inch of soil leaving the stick above the soil. Keep it watered and wait for signs of new growth. The buds on the stick will swell up and produce new leaves. Tropical HibiscusPLEASE TELL ME MORE ABOUT GROWING, WATERING, FERTILIZING, SUN EXPOSURE, AND MAINTAING THE HIBISCUS PLANT…..THANK YOU VERY MUCH AND HAVE A NICE DAY! Hello! My hibiscus is defeating the odds this year… My poor 1 year potted hibiscus has been pruned back by the local deer just before it was about to bloom, I recently brought it indoors for winter and then the cat decided to pee in the soil. I rinsed the soil with water to dilute the pee and I think it over watered the plant…. Now the leaves are wilted but still green. I tried letting the soil dry out a day or two and the leaves didn’t recover. I’m assuming wilt disease? So I tried the treatment of bleach and water to kill any fungus in the roots…. How long will my poor plant take to recover (if it recovers) and is there anything else I can do or symptoms to expect while it recovers?